Indoor environment, mounted securely against a wall or other flat surface. Speaker wire included with package: West Penn Wire, 100 ft, Plenum-rated, 18 gauge, 2-conductor. The TeachLogic WM-2 Wall Mount Speaker Package consists of two SP-2000 wall mount speakers. The TeachLogic WM-4 Wall Mount Speaker Package consists of four SP-2000 wall mount speakers. SP-628 is a 6.5″ two-way full range compact coaxial ceiling speaker, providing low distortion and a smooth natural frequency response ideal for articulate vocal clarity. The SP-628 has integrated steel backcan along with 24″ tile bridge which allows for quick and easy installation. 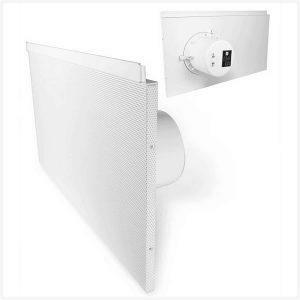 ETL PLENUM RATED CONFORMS TO UL2043 STANDARD Intended use: Indoor environment, mounted parallel to floor plane in a 24″ wide suspended ceiling tile. Power: 30 watts continuous Impedance: 8 ohm Finish: White powder-coated Speaker wire included with package: West Penn Wire, 100 ft, Plenum-rated, 18 gauge, 2-conductor. 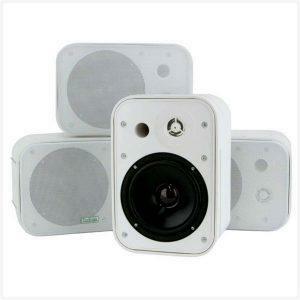 CS-2 The TeachLogic CS-2 Ceiling Speaker Package consists of two SP-628 ceiling speakers. CS-4 The TeachLogic CS-4 Ceiling Speaker Package consists of four SP-628 ceiling speakers. Indoor environment, mounted parallel to floor plane in a 24″ wide suspended ceiling tile grid. The TeachLogic LS-2 Lay-in Ceiling Speaker Package consists of two SP-628L Lay-in ceiling speakers. 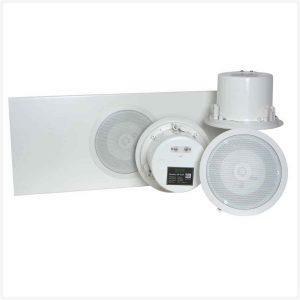 The TeachLogic LS-4 Ceiling Speaker Package consists of four SP-628L Lay-in ceiling speakers.